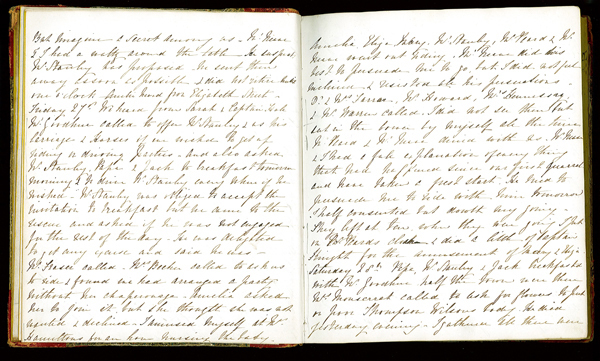 Diary of Charlotte Owen Harris,1848 and transcript from Harris,Robin. The Eldon House Diaries: Five Women's Views of the 19th Century. "Oct 27 We heard from Sarah & Capt Hale [82nd]. Mr Goodhue called to offer Mr Stanley & us his carriage & horses if we wished to get up riding or driving parties, & also asked Mr Stanley, Papa & Jack to breakfast tomorrow morning & to drive Mr Stanley everywhere if he wished. Mr Stanley was obliged to accept the invitation to breakfast but we came to the rescue & asked if he was not engaged for the rest of the day. He was delighted to get any excuse, & and said he was... Mrs Becher called to ask us to ride & found we had arranged a party without her chaperonage. Amelia asked her to join it but she thought she was not wanted & declined. I amused myself at Mrs Hamiltons's for an hour nursing the baby. Amelia, Eliza, Mary, Mr Stanley, Mr Peard & Mr Neave went out riding. Mr Neave did his best to pursuade me to go but I did not feel inclined & resisted all his persuasions..."